I’ve been thoroughly entertained for a week both by the festival itself and by old friends I’ve met up with (planned and unexpected) and so far this trip has been a 2013 highlight. 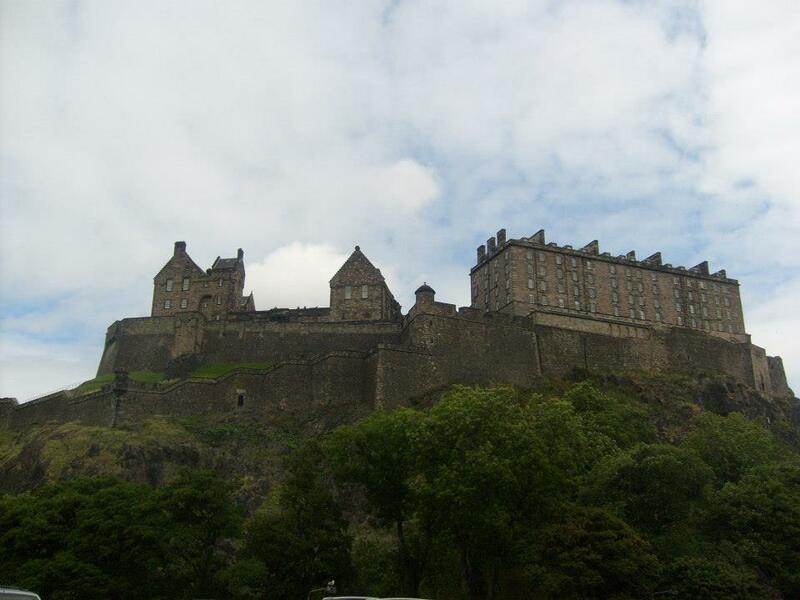 Edinburgh Fringe is a swirling, bubbling, boiling concoction of the performing arts. And I’m dizzy. There are, I’m told, 45,000 shows here over the month of August and, it seems, every single one of these shows is represented on The Royal Mile by a clown juggling on a unicycle, dishing out flyers as she goes. It’s overwhelming. And it’s unique. With so much on offer, there’s always going to be a wide range re quality and it’s difficult to make a decision re what to view when all you have are lists and lists and lists of names. I’ve been advised to stick to a few venues that are known for picking quality shows and then I also chose on the basis of my own taste/interest/content (ie my novel involves a lot of juggling, so I went to see a juggling show). But even with this advice in hand, the results were not quite what I expected. The juggling show has so far been the hands down (‘scuse pun) best theatre I’ve seen at the Fringe so far. ‘Smashed’ by the Gandini Jugglers at the Assembly Hall is a hybrid of dance and juggling which manages to be smug-ironic funny, thought provoking, skilful, thoughtful, entertaining and just the right amount of crazy. And I only went there for juggling research purposes! Unexpected delight. Five stars for ‘Smashed’. And I’ll give a four star review to ‘The Events’ at the Traverse. The Traverse has a reputation for picking the cream of the crop and scooping up Fringe firsts. This is a play that raises questions that linger in the mind long after the performance – which is what art should do. The performances by the two professional actors are outstanding and the writing is clever and weaves and juxtaposes opposing philosophies. The Events uses a local choir partly to sing, partly to act out ‘members of the public’. They don’t try to be anything but reading-off-the-page-with-a-mike, non-actors which while I admired what the production was trying to achieve, I felt these moments jarred too much with the rest of the performance. Also, the cynic in me wondered if the non-professionals were funding donkeys – something which only works if you can make it feel right and I don’t quite think this quite did. Still, it’s a small quibble in an otherwise excellent piece of theatre. Zoe Lyons, at the Assembly rooms also gets four stars. Her comedy is keenly observed simple truths about life, warmly told. Three stars to ‘The Secret Agent’ at the Traverse. This production was popping with good ideas, visually interesting, beautiful moments of choreography, funny comedy, high drama etc… the problem was that the piece never really figured out its own identity and ended up being rather a blancmange of genre, each one pulling against the next and the audience and production lost the plot, quite literally. And two stars to ‘Tell me the Truth about Love’ at Underbelly’s Topside. Much like with the Gandinis I went there for Auden research purposes and this is his work put to music (inspired by the rhythm in his poetry) and sung in a Noel Cowardesque manner. The idea was interesting, the material good but somehow it fell down on the delivery and the result was Brideshead camp and monotonous after a fashion. Obviously, I’ve only seen a few grains of sugar in a bowl full of performance – And there’s still a week to go! Oh, and thanks to Colette (comment on previous article) for the dining tips – Spoon for lunch and Kilimanjaro for coffee are ace – maybe see you there. 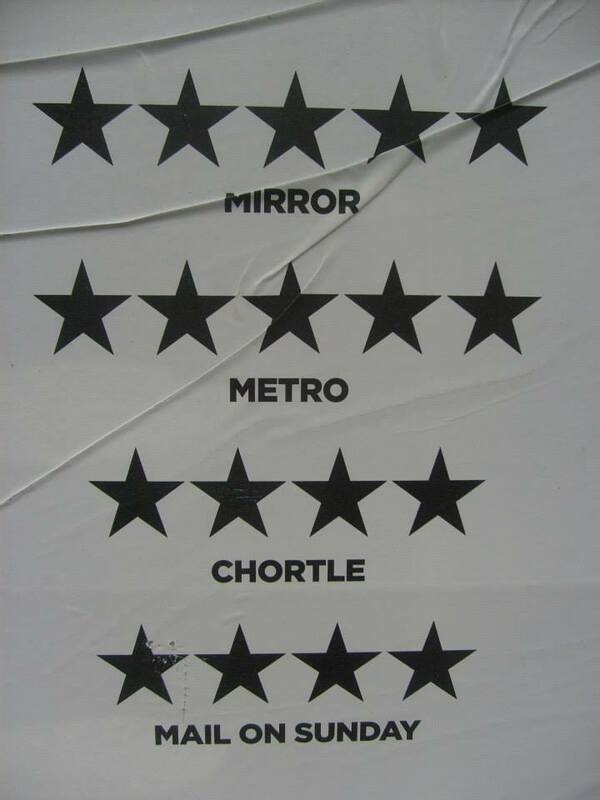 This entry was posted on Tuesday, August 20th, 2013 at 08:55	and tagged with dance, drama, Edinburgh, edinburgh fringe reviews, juggling, music, review, song, theatre and posted in Uncategorized. You can follow any responses to this entry through the RSS 2.0 feed. Nice picture. Takes me back a few years, I performed at the Fringe a couple of times (music). Haven’t been to the Fringe or even Scotland! Would love to go one year. I love stand up comedy. The top joke this year at fringe was: “I heard Cadbury are bringing out a new Oriental chocolate bar. Could be a Chinese Wispa.” I had a good chuckle. If you have the time…I often submit poetry to publications, but there are so many places out there! Is there any site or method you use to target which publications and such that you send your work into? Thanks for any info! Peace. I have been published before, but sometimes it feels like it is a lot of work and not very efficient for the amount of time put into it. Even more than writing! :). I’m always looking for more advice and perspectives! I’m afraid I won’t get a chance to see it in Edinburgh – but thanks for the tip! I’ll certainly keep an eye out for it if it’s touring. I got to see a lot of good stuff via word of mouth recommendations. And I’ll certainly be back to Edinburgh. 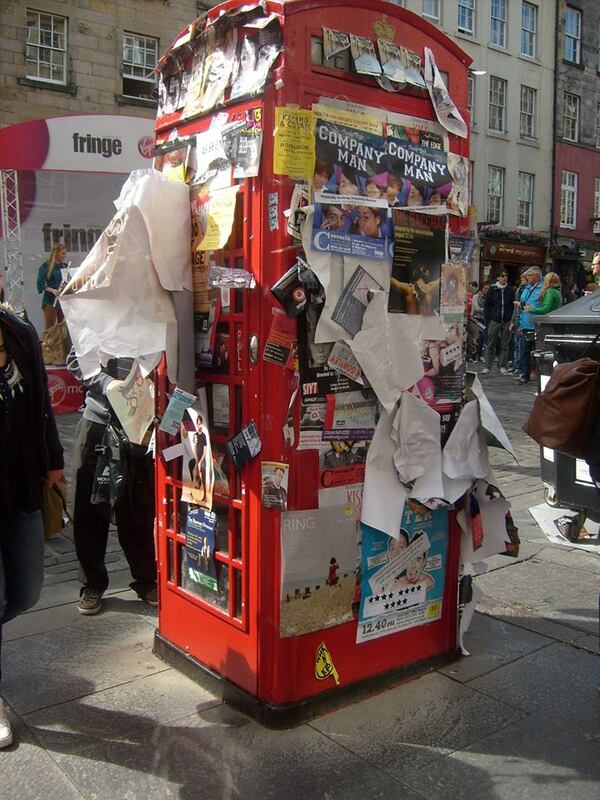 I hadn’t realized Fringe had been going on in Edinburgh this past week. Rats! My daughter’s just moved to Glasgow and could have traveled over to catch the ‘madness.’ I’ll tell her to put it on her calendar for next August.